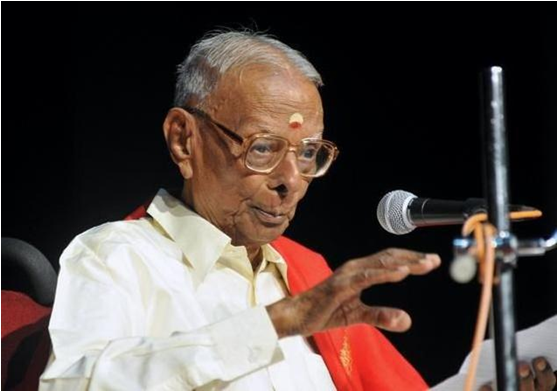 Our beloved doyen of Carnatic music, vocalist Padma Bhushan Shri. R.K. Srikantan, passed away on Monday. On January 14, he had turned 94, and his birthday celebrations had seen the release of a biography, “Voice of a Generation”. He was indeed the senior-most performing musician of Karnataka and till the very end was blessed with a sonorous voice that resonated at concert halls all over the world including at our very own Sri Siva Vishnu Temple under the auspices of Nadatarangini and also workshops, where number of people of this area participated and were able to get valuable guidance from him. His workshops and lecture-demonstrations on the Trinity, Tyagaraja, Dikshitar and Syama Shastri, and other academic aspects of music are judged to be veritable textbooks for students and connoisseurs. Shri Srikantan has trained more than 500 students directly and thousands indirectly on AIR’s “Gaanavihaara” music classes, a popular Carnatic music class that went on air for several years in South India during his 32-year tenure at Akashavani. He has been a role model to many of our youngsters here involved in music. May his legacy continue……..